I've watched over the last year as many of my favorite boutiques around town closed their doors. Some store owners ending their venture all together, others switching to web-based businesses in order to save money on overhead. So, needless to say, when my parents came to me and told me they were pursuing their retirement dream and opening a gourmet grocery store in Fishers, Indiana, I was more than a bit skeptical. I knew retail wasn't always easy and I knew that sometimes passion wasn't enough to be successful. However, I thought they would at least have a chance to prove me wrong. 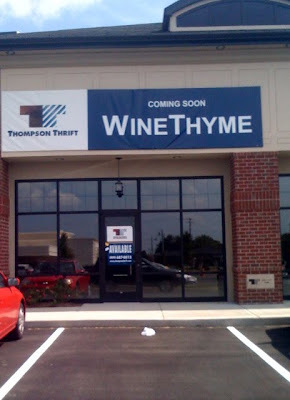 They spent over a year researching their ideal location for WineThyme and began negotiations with Thompson Thrift to move into a new retail space at the corner of 116th and Olio Road. Thompson Thrift was more than supportive and we were all excited when the "Coming Soon" banner was hung. They filed with the Alcohol and Tobacco Commission for their wine and beer license in October 2009 and quickly made contacts with some of the best gourmet food wholesalers, wineries, beer distributors and local vendors to offer unique products. They arrived at their initial hearing in Hamilton County on December 9, 2009 with no idea of the obstacles that would be thrown in front of them. They learned that Crown Liquors, United Package Liquors and Payless Liquors had joined forces, hired a single law firm and filed a motion to deny WineThyme a license. Citing a longstanding quota issue (permits are granted based on population in any given area) and arguing the difference between a wine store versus a gourmet grocery store, this team was ready for legal battle. With little knowledge about the history of the quota issue and not enough data supporting what other products would be sold on site, their license was denied. They believed they had every right to open a store and more determined than ever, they filed their appeal and sought out consumer support. The more people they spoke to, the more support they found. People in the area were in need of a store like WineThyme and they began their own letter writing campaign to garner support, almost 100 letters poured in. The appeal hearing was scheduled for February 3, 2010. They filled the room with supporters: neighbors, fellow small-business owners, contractors, sub-contractors, friends and family. The hearing was scheduled for 10 a.m. and after an hour, the hearing officer appeared and informed everyone that the hearing would be rescheduled due to improper public notice. Both legal teams agreed on February 19, 2010, and the new date was set. My parents knew, in their hearts, as each day passed they were losing start-up capital while paying legal fees and the three stores were winning without just cause. It was beyond frustrating. About a week before the scheduled hearing, the liquor stores and their legal team filed a continuance, delaying the hearing further. 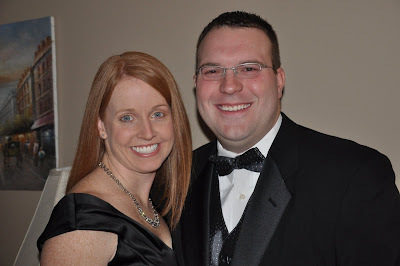 They contended that their lawyer had a personal obligation and they wouldn't substitute to someone else in the firm. Coincidentally, during this time lapse, the Indiana Association of Beverage Retailers (Crown Liquors is a confirmed member of this Association) were petitioning to the state, pushing for clarity in the confusing 2008 quota ruling. Their primary argument is against the influx of permit applications being received by Walgreens and CVS pharmacies. The ATC now instituted a freeze on issuing permits, despite the fact that WineThyme's request has been in limbo for almost five months. Somewhere in this mess, my parents' retirement dream of a little family-owned gourmet food and wine store got lost. Another spot in a strip mall remains empty and the "Coming Soon" sign taunts us each time we drive by. I write this not only as an angry daughter, but as an angry consumer and an angry voter. I was raised to believe in the American dream and the idea that you can do whatever you want to do. I was taught that friendly competition kept our prices in check and gave us options as shoppers. I thought in a time of economic turmoil a new business venture would be supported by our government, not blocked by red tape. I had no idea, when I walked into one of these package liquor stores, the profits they were making from my purchase were being used to keep small competitors out of the marketplace. I write this because I thought someone else might want to be angry too. It has been a few weeks now and transitioning the girls into their own rooms has gone surprisingly well. They still get up before it is light outside, but they are napping and going to bed at night with only the typical 2-year-old protest. 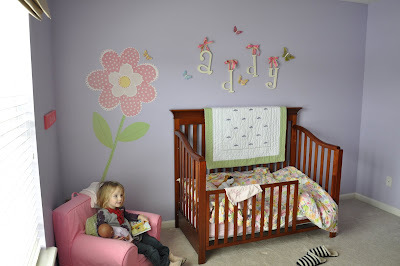 The nursery pictures can be seen here. So, we determined it was probably time to give Addy her own space. 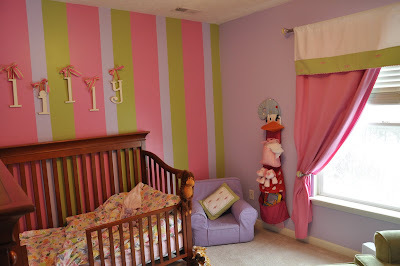 We kept Lilly in the previously shared room and added a few things so she didn't feel left out, then painted & decorated our former guest room into Addy's room. 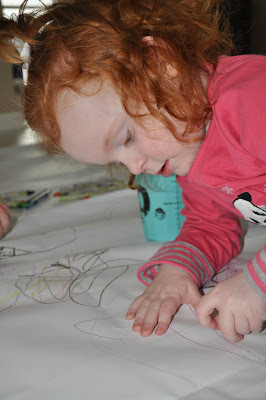 After reading KB in the City, I thought, we too, might have been too ambitious, as we were doing it in a small window of about 8 hours while the girls stayed at Grandma & Grandpas. But it turned out great and the looks on their faces were pretty priceless! 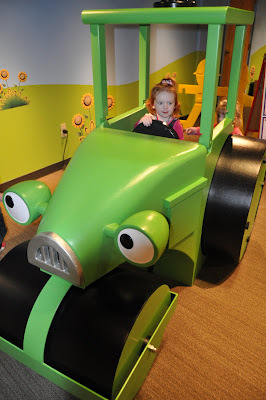 We spent a day last week, with some old friends, checking out some new exhibits at the Children's Museum. It was so fun! 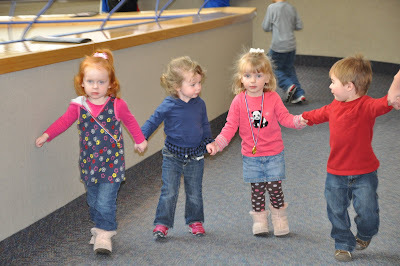 The girls impressed me: listening, holding hands, rarely needing the single stroller I took, and enjoying EVERYTHING. 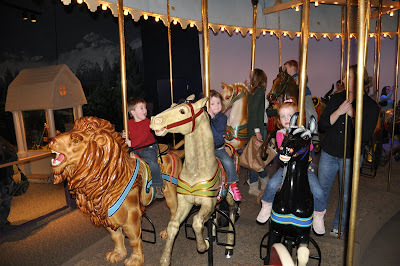 From Bob the Builder to Barbie, the Carousel to the dinosaur exhibit and, of course, the playscape area. They were soaking it all in. Enjoy the pictures! "Ladies & Gentleman....start your engines." 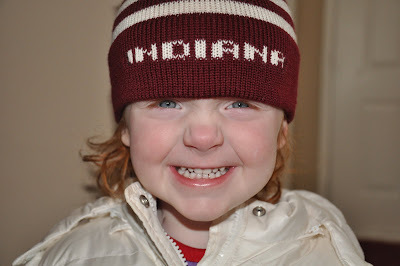 Will Lilly be braving Bloomington winters in order to be a Hoosier like her daddy? 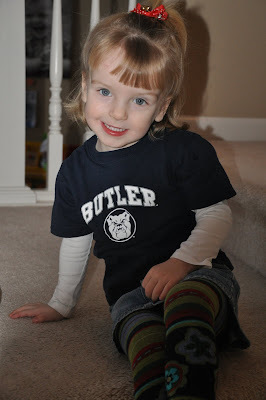 or, like Addy, poised for sorority recruitment at Butler like her mom? With March Madness' Selection Sunday less than a month away, we'll be rooting on our Bulldogs AND our Hoosiers (but I think one may have much more of a chance than the other, just sayin)! Looking forward to a little MARCH MADNESS! And to my dad, who was my first valentine and taught me that the daddy-daughter connection is just as precious as any other relationship celebrated on this day! 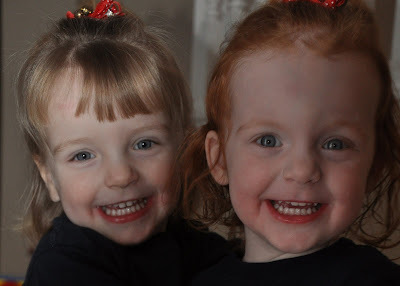 Sometimes we forget our little munchkins are ONLY 2! We stay up at night and talk about how fun it will be to camp and fish and swim and hike with them and when it snows, we get as excited as we used to when we were kids. 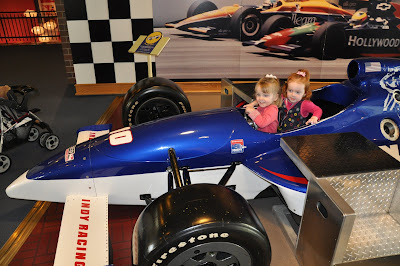 So, when Indy got hit with 7 inches last week, what else was there to do? We layered up and head out to the hill Jeremy had "scouted" earlier in the week with our 2 shiny new sleds. 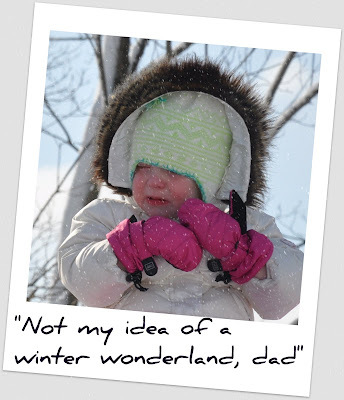 The wind chills were in the single digits....not winning any parenting awards on this one. One trip down each (Daddy & Lilly on the left/Addy & Mommy on the right) and then in the car and home for hot chocolate...I guess there is always next year? For now, we'll stick to the "bunny hill" in our neighbors yard, video linked, here. 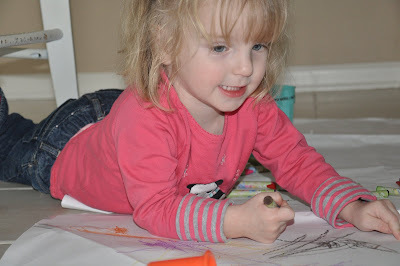 Jeremy and I have little to no artistic talent, but the girls are loving craft time lately. They frequently get into the car after their preschool program, proudly displaying their painting/picture/coloring page of the day and yelling "I show Ga Ga Jody." Knowing that their teacher-grandmother will be the most impressed with their creation. Ga-Ga Jody's reaction never disappoints them and boosts their artistic ego when she visits. 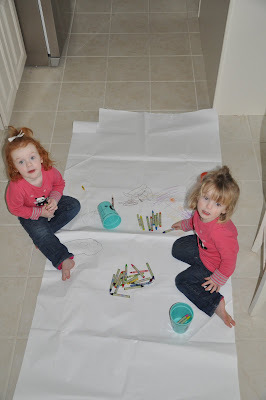 We stayed home most of the day Friday, (heeding blizzard warnings) and painted, played with play-dough and colored on a giant piece of paper roll. 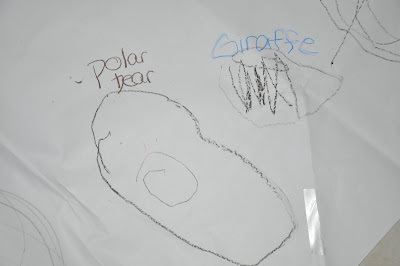 And here are a few of their drawings, I titled them so you can see what they told me they drew--loving the imaginations of a 2 year-old! To update on the sleeping sagas, naptime is back in full-force, sleeping peacefully in the afternoon every day since the splitting. Bedtime is harder as both girls want our attention and when putting them down solo, they tend to get pretty upset. Addy will frequently say that she wants to sleep with her sissy, while Lilly has embraced the freedom and the peacefulness of her own room. 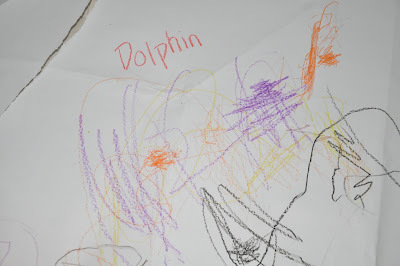 I haven't tackled decorating Addy's room yet, but that will be an upcoming project. 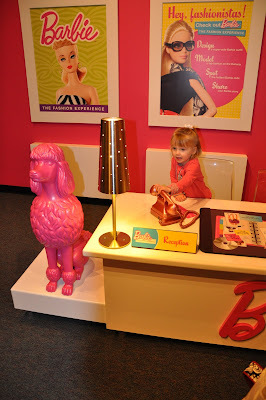 You can see what is now Lilly's room here and if you have ideas for Room #2, I'm taking them! Last night, just 1o days shy of the 2 1/2 year mark, Addy & Lilly slept in different rooms for the first time. I was sad as I realized that from the day I found out I was having twins (which coincidentally was almost EXACTLY 3 years ago to the day and also coincidentally a week prior to the Colts winning the 2007 Superbowl-weird, right? ), I dreamed of having little ones cuddling next to each other while sleeping in the same bed. Unfortunately, with my 2 rowdy girls, that was never a reality for us. Their different sleeping habits coupled with a continued biting battle, made the split necessary. I'm hoping this solves a lot of our sleeping issues and grants me some peace in the afternoon. We haven't had an afternoon nap for over a week, so I'm crossing my fingers that this changes the game a bit.